Overall these pants do what I want them to do—if you see them on sale go for it, otherwise they are little pricey. I'm happy with them, but there are a few issues that might be solved by other brands. Adjustability: The ankle cinch option is awesome—until it breaks (and it breaks reliably—on my pants, as well as the pants of three friends). I knotted mine so they are cinched (loosely) all the time, others cut the string, removing the cinch option completely. I do not want to lose the cinch option. It's a shame the cord isn't attached in a more durable way, because it is a great and necessary feature if you're going to be in serious weather over longer periods of time. Breathability: Not too bad considering the pants are waterproof. If you're in a heavy storm and your pockets are zipped and your ankles and waist are cinched/tucked you won't get much ventilation. If the pockets are unzipped and you're not totally sealed up for a heavy storm the ventilation is actually pretty good. The pants are loose enough that air can flow in at the ankle, through the mesh hip pockets and even at the waist depending on how you fit your pants. Moisture: They sure don't wick sweat away from your skin. Warmth: Yep. Depending on the season it is great that these pants add heat. In a hot summer storm I would just not wear them. When you're really moving they trap a lot of warmth, so if it's not cold to begin with you might be way, way too warm. Plus it's good to let the rain wash your legs every once in a while. Layering: These are great for layering, lost of room for base layers and you can tuck shirts, jackets, gaiters, socks, whatever you want! 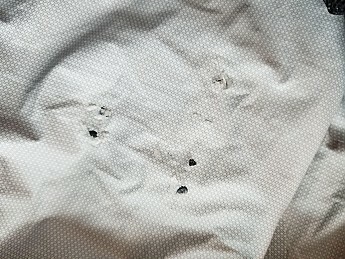 Construction, Durability & Conditions: I have had these pants for three years, and I used them on my six-month thru hike of the PCT. Outside of the ankle cinch cord, these pants hold up great. I am happy with them, but I might look at other options next time. I would buy them again at a reduced price. 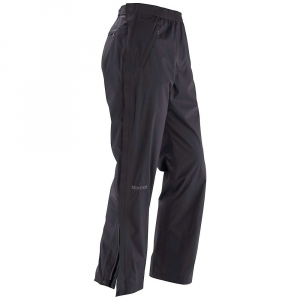 For me, the Marmot PreCip Pants serve as a lightweight alternative to snow pants when the weather is not warm but not subzero. They are just right for the beginning or end of the snow season when you appreciate the impermeability but don’t want the extra bulk. I like how the pants find the right size between being able to maneuver in them while not simultaneously looking like MC Hammer pants from the early nineties. They are about just the right size to pull over thermal underwear or another type of thin pants. The crotch is high enough to allow me to jump, climb, scurry. There are double layered velcro adjustments on each side of the pants. These give you a little room to adjust the sizing. This is also true of the ankle adjusters. They can be tightened so as to fit ankles or cankles. Marmot’s “Precip” technology seems to less breathable than a traditional Gore-tex. In fact, I don’t think the “Precip” technology breathes at all. This is totally fine in this model however because the entire sides of the pant leg can be unzipped. This allows the user to diffuse as much moisture as needed from the interior of the pant. The material does a fine job of keeping the water out, even when kneeling in the snow for longer periods of time. The fabric does not breath in my experience. I find that they are much better suited to winter conditions as opposed to rainy conditions. 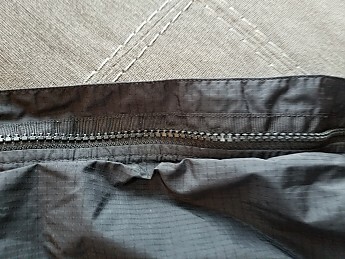 In warmer rainy weather, you cannot unzip the sides or rain will get in. If you keep them zipped up, your own perspiration builds up quick and you become just as wet on the inside as the outside. They are a little better suited to cold rain/sleet where I not as prone to sweat, but even in these conditions, they are not ideal. Because the fabric does not breathe, it is wise to think ahead while exercising. It’s better to unzip a bit beforehand and be cold for a short time. As you continue to exert yourself and perspire, the initial venting will keep you dry. If you wait until you sweat before your unzip, it will be too late and then you’ll have to deal with a slow burn off of the moisture. In really cold conditions, this can work to your disadvantage. The pants are excellent at stopping wind because of their impermeability. Really they are an uninsulated shell to be used in conjunction with other undergarments. The pants alone will not keep the user very warm. 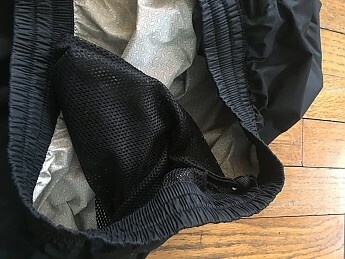 As mentioned above, the pants pair well with insulated underwear, thinner wind breaker style pants, or more fitted underlayers (stretch, yoga, etc.) They are a bit too fitted for normal hiking pants, jeans, etc. The rip stop material is fairly durable. The Precip layer is thin but has held up surprisingly well. I guage the durability of impermeability by how well it holds up in high friction areas. In the case of the the Precips, the layer still looks perfect after two years of me kneeling around camp and while exploring. One weakness of the Precip material is that it is prone to ember burns. It melts easily. Once a small hole melts in the material, the weatherproofing is compromised. This happened to me on an outing. I’ve since patched the small holes and the pants are performing well once again. There are two side pockets and one back pocket; all are zippered. They double as vents because they all have mesh liners. The ankles have shock cord draws on them. They cinch and release easily but hold their draw. They are also each fitted with a snap button to seal the deal. The velcro sides and zippers work consistently well. 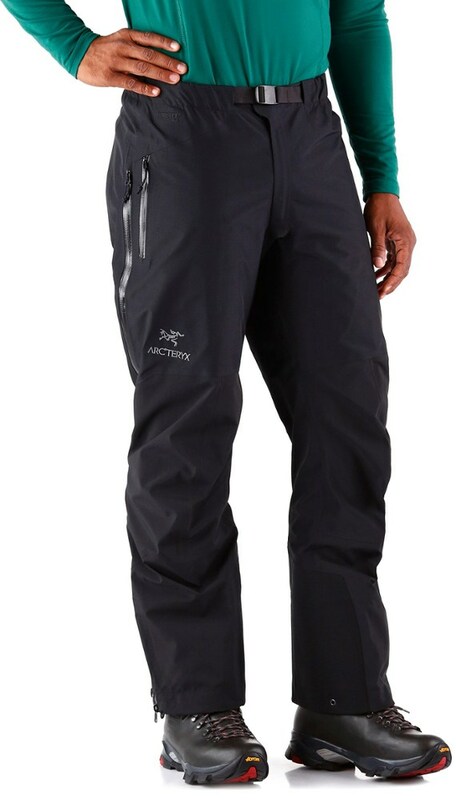 The side zippers that run the length of the pant legs have baffles to help keep out the cold and moisture. All parts and features really do work as expected. No complaints. I’ve tried the pants in all four seasons for two years now. I now use them while riding my bike to work in the morning on cold days. They break the wind very well. They are my go-to layer for winter campouts/exploring between 40-20°F. When I first received the pants, I was a little dubious because I had a really bad experience with the Marmot Precip Mitts. Each uses the same technology. Even so, the pants are better suited to the tech than the mitts in my experience. They function as desired, and they are reliable. I give them my endorsement for the conditions that I mentioned above. I have used them for two years on over two dozen outings and I ride to work with them on a bike when weather necessitates. Thanks for the helpful review, Jesse! Great for hiking, backpacking, any wet or chilly to cold weather. Stretch waist, flexible to fit over shorts, pants, etc. 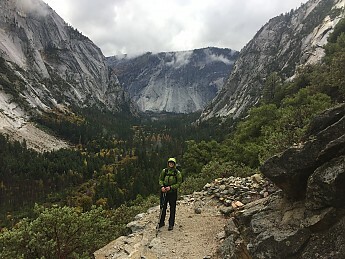 Summary - These are my go-to rain protection pants when hiking and backpacking. 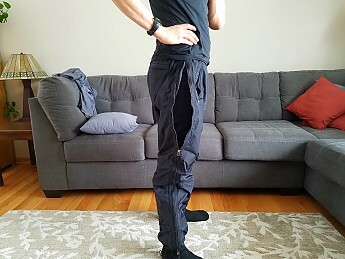 The full length leg zippers can not be overrated — adds ventilation when needed, easy to put on quickly in sudden downpour, and zippers do not leak in heavy rain. 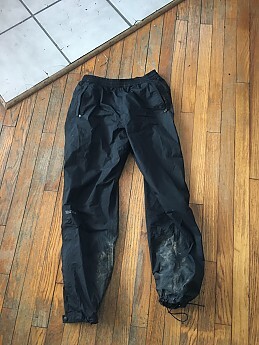 My Use - These pants have had a lot of wear on mountain backpacks in the Rockies and Sierras. Also great on day hikes in the rain when I want to be out for at least several hours and remain comfortable. I don't mind wet legs if I know I can warm up afterwards. But when backpacking or camping, staying dry is critical for ongoing comfort not to mention hypothermia, so rain pants are essential. My Criteria - Adjustability & Ventilation First, then Fit - A rain pant needs to have full length zippers, be breathable, and fit well. I wear it over shorts, sometimes over long johns or pants. 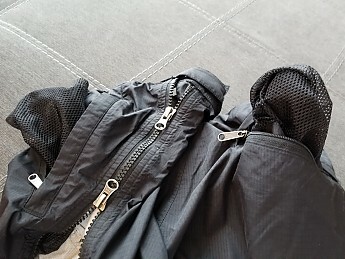 The full length zippers are critical for ventilating — open up the top for ventilation while the bottom is closed (where puddles, streams, and most of rain hits). See picture. 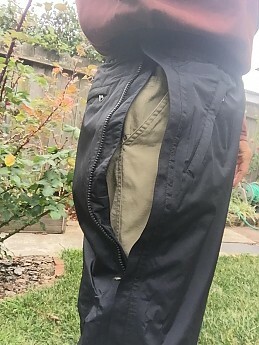 The full length zippers also enable access to shorts or pants pockets, and allow you to put on rain pants without taking off boots. This is a nice convenience, that quickly becomes a huge benefit when mountain rain showers start suddenly. 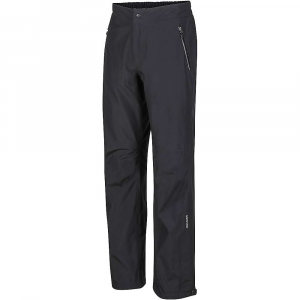 This rain pant has the ventilation and adjustability features I require. Next comes fit, and this pant fits me well, see pic and Sizing. For me, its not too tight, is flexible to fit over shorts or pants or long-johns and not too airy to feel like I am wearing bozo pants. Durability - After 3 seasons of extended backpacking use, they are still performing well. I do take care of them, rinsing off dirt after each outing. To protect the seat of the pant, I am careful where I sit, selecting smooth rocks and not twisting while sitting. Not always possible but I try. 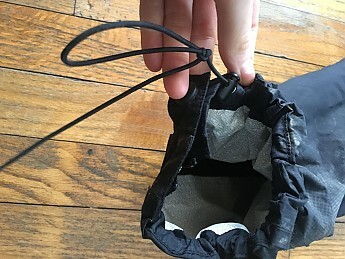 A little secret - I bring a small ensolite pad to sit on and I believe that has saved the seat of these pants, and it is comfortable and warmer than a cold rock. I try to stay away from scraping on rocks with pant legs but it happens and no holes at lower end yet, outer fabric appears to be durable. Thoughts on Improvements - The side zippers work great, have had no problem with them, but they are a bit bulky. Makes me wonder if there is a lighter zipper that is still functional and would make the pants lighter. Also the two front pockets and one rear pocket are nice but overall I don't use them, I access the pockets in shorts or pants underneath. Taking these pockets and associated zippers out would make the pants lighter and fold up smaller. Also a slightly tougher seat would help for sitting on rocks, cuts down on wear and tear. Sizing - My short legs typically create sizing issues. Marmot makes these in different lengths for each size category S, M, L. I have a 32 -34 inch waist and a 29 - 30 inch inseam, and use the Medium Short. Rain or Snow? - I use these pants for rain only. If it's in the transition zone where it's cold enough to rain or snow, I will take these because they shed moisture better than snow pants. But if it's a winter day, snow pants are my preference. 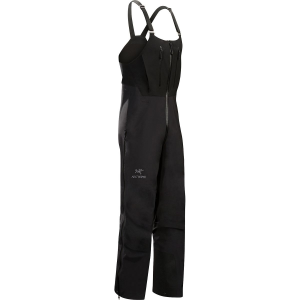 Overall - A great pant that I will re-purchase when they wear out. Now if there were a version without pockets and associated zippers, it would be the ultimate. 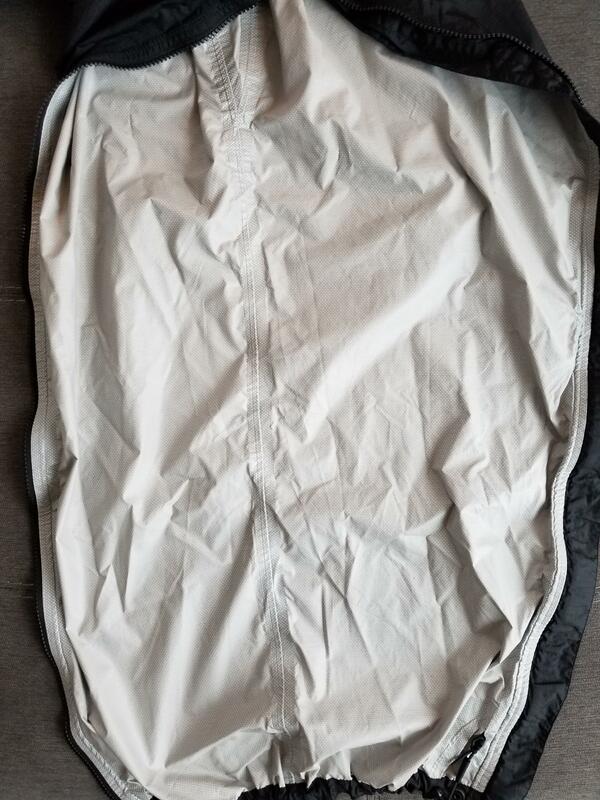 Although sometimes I do like those pockets, I can do without them and as I get older I am looking for ways to lighten the load for backpacking. I had no problem with condensation. Great waterproof rain pants! Lightweight and durable. 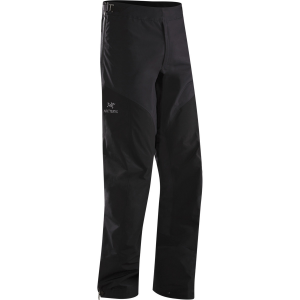 Great waterproof rain pants! Lightweight and durable. Zippers and snaps on legs and an elastic drawstring at the ankles make this the best rain pant out there! 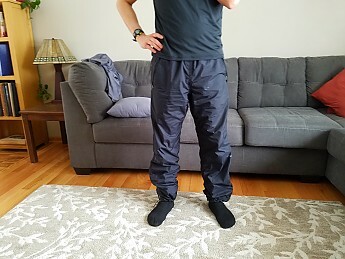 I bought these last year to actually wear with a base layer and hiking pant to make a good snow pant and it worked great! The weather and activity on the mountain can change quickly so instead of snow pants I thought layering was the key, and I was right! I never even wore my Mammut snow pants that cost me a fortune this year. I just wore layers with the rain pants on top. When I got off the snow I took the Precip Pants off with no need to use a dressing room because my hiking pants were underneath. These pants are lightweight and do the job. No need for anything else. 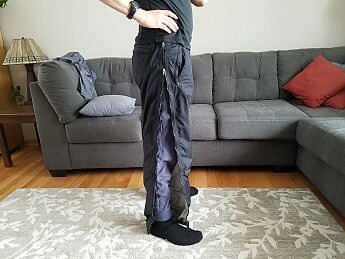 I have heard that the rainstorms come on pretty quickly in the High Sierras, so I will be including these pants with my gear for the JMT. I'm sure they will come in handy out there. I am just gonna say "NO!" 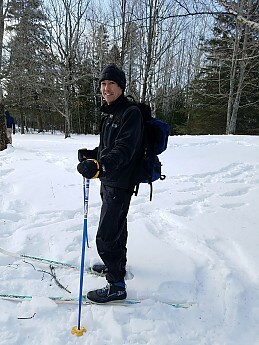 I have used these pants for snowshoeing about a dozen times and recently took them out for a hike in some steady drizzle. Not 20 minutes from the trailhead, these pants were showing signs of wetting out. I stayed out for about 2 hours, and by the time I was finished the thighs of the pants were completely wet, inside and out. Specs that I have found online indicate that this fabric supposedly carries a fairly hefty 15000mm waterproof rating. Despite this, these pants couldn't hold out a steady but light rain for more than half an hour. I will contact Marmot to see if they care to do anything about the product, as I am hoping that this product is simply defective. Otherwise I will keep these as strictly a winter shell pants, as they do work well for keeping the wind out without adding bulk. If these pants are not defective, then I am not even sure why I would even add the 9 measly ounces to my pack weight. The pants are otherwise well constructed. 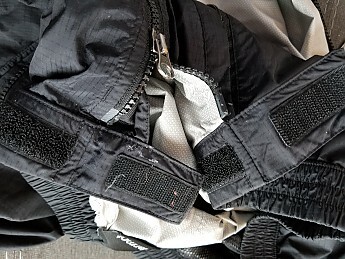 The 1 rear pocket and 2 front pockets are shallow but adequate, and the drawcord works well if you need to tighten them up. If they actually kept out the rain, I would most likely own several. Marmot claims that the new PreCip (Spring 2011) is now "more durably waterproof and breathable than ever". I am not sure if this is a problem with the older model of PreCips, but hopefully they will replace the product. These are the Timex of pants - takes a licking and keeps on ticking. Not that I recommend or advocate licking pants. Maybe I should say the EverReady of rain pants, Just keeps on going. A real value. Very functional. Dry. Breaths well. Durable for the weight. The DWR stays on and I never had them "wet out". I have used my Precip Pants for two years in all kinds of weather. I never babied them. Washed them with regular laundry. The partial leg zip allows enough room to slide my size 11 Asolo 535's in and out with a little effort. 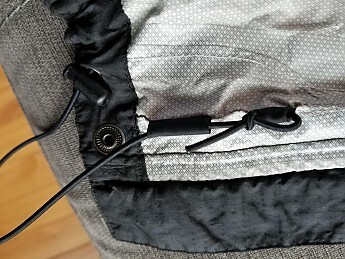 There is a drawcord and a snap at the bottom to adjust the cuff. The pockets are very functional and can be used to vent (a little). The fit is good - no issues with "crotch stop" while high legging over obstacles. I never feel them when I am wearing them and that's a good thing. They do breath pretty good and the interior laminate has never peeled or shown any wear. I have sat on rocks, logs, pavement and kneeled on all kinds of stuff without abnormal signs of wear. The nylon laminate fabric is thin, but wears well under normal use. I recently got on a trail that had a lot of blow downs and sawbriars along with a sugar coating (snow). My pants got ripped up really bad. I sewed and selaed them and wore them the next weekend for a 5 day that included rain, snow and very cold wind - no problems. Amount of use --I backpack 100 or more days/year in Tennessee and North Carolina where it rains/snows a lot. These pants have been well tested and never failed me. For the money these are a fantasitc value. My Precip Jacket is 5 or so years old and still sheds wind and water and is still extremely functional. (jacket has been retired from trail use, and is used at work) Precip is good stuff. I recently bought a Marmot Minimalist Jacket and may get the pants as well - or I'll just get another pair of Precip Pants. Either way I am sold on the Marmot name. Good product - I would highly recommend these pants. I read a lot of reviews about these pants before I bought both my wife and myself a pair. 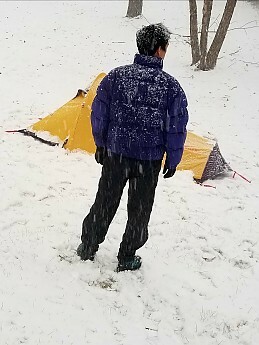 Some people thought they sucked, but I already had the Marmot Precip Jacket and I love that so how bad could the pants be. My wife and I went on a 4 day rafting trip, 3 of those days it was very windy and rainy. The pants worked incredibly well. They were easy to put on and off over our muddy shoes, very breathable allowing my wet pants to dry while still wearing all my layers. And the waterproofing was waterproof, imagine that. They're very lightweight and easy to stow and carry, but I think if you're rough on your gear these pants may be too lightweight. My wife was very, very pleased with the pants and in the end a dry, warm girlfriend or wife is all that matters. 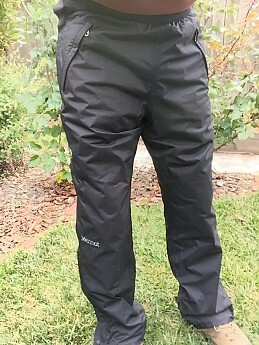 Bought these for general rain wear/to take hiking in the mountains/rainy bike rides. All in all I like them very much the fabric is fine but seems like it could rip. I think they are rated at 15000 for waterproofness but I managed to soak them through (a little) once while spending four hours in a steady rain while power washing my deck. A brutal test for any rain wear although the Marmot Oracle Jacket kept my top half dry.